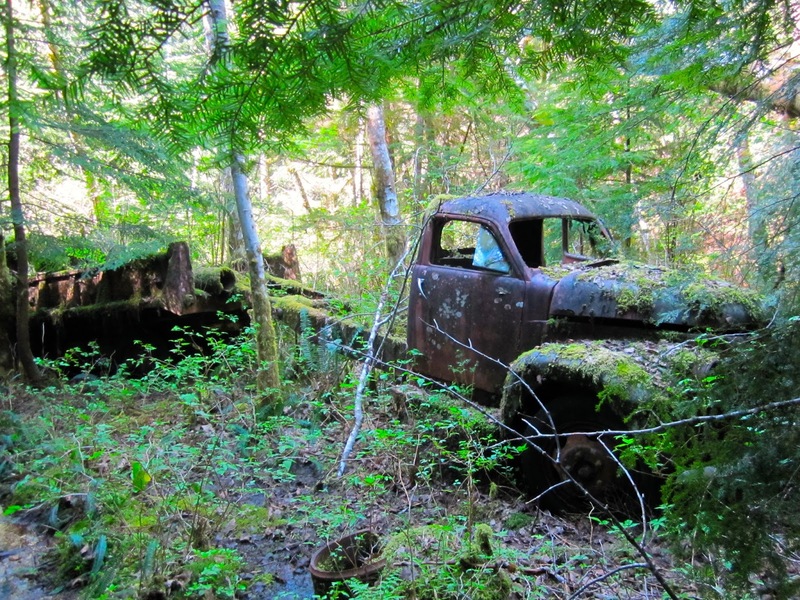 The Powell River backcountry is dotted with treasures from times gone by. 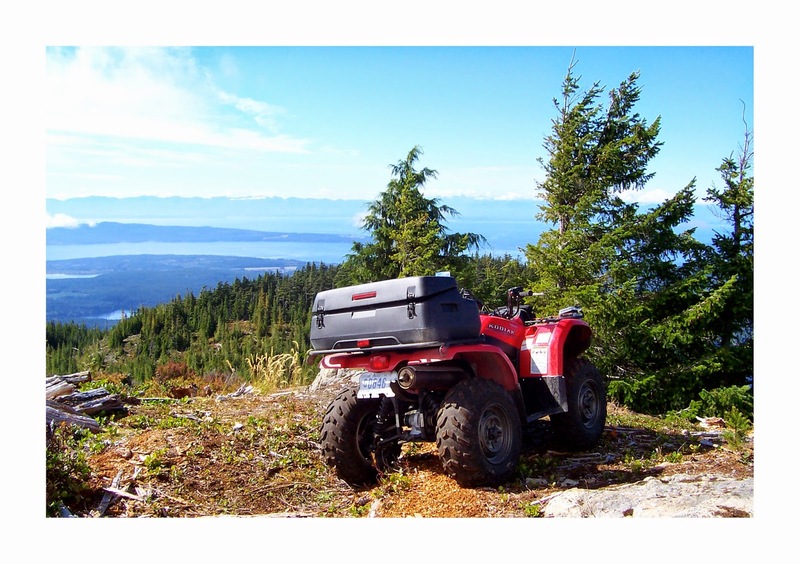 Go hiking, biking, or quadding and you'll discover old logging equipment, homesteads, plank roads, train trestles, cabins, and much more. Over the years, our friend John has led us to some exciting places where history lives on, like a natural museum. Powell Lake's slopes have been logged since the late 1800s. The first stop on this tour is Chippewa Bay in the northwest corner of the lower lake. Here there's a logging dock and barge ramp. Nearby, Museum Main heads uphill to two abandoned Steam Donkeys. Steam Donkey #1 is close to the main. 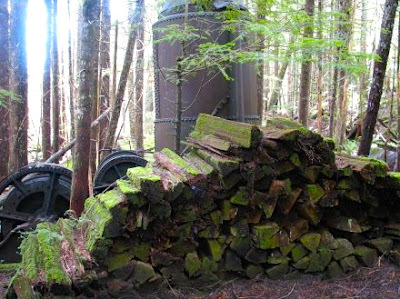 It may be rusted, but it's still standing and surrounded by bits and pieces of logging history. Steam Donkey #1 along Museum Main. Steam Donkey #2 is farther up the main and reached by a trail through a logging slash and second growth trees. Steam donkeys were used in early days to pull trees out of the forest and down to the lake for transport. You can still see wood stacked by Donkey #2 ready to stoke the fire to produce steam power. Steam Donkey #2 is reached by a trail. Photo credit to John. East of the Chippewa dock is a place we call The Point. Before the dam there was a logging camp here along the shore. When the lake level is low, you can see bits of pottery and parts of an old woodstove wedged against a stump. Oriental crockery at The Point in Chippewa Bay at low water. While it's possible to get to the steam donkeys by boat and a long steep climb, to reach the old shovels on Heather Main an offroad motorcycle or quad is best. Heather Main links Theodosia Inlet and Chippewa Bay so you can reach the shovels from either side. I guess the cost of removal must have outweighed their value. Bucyrus Erie shovel on Heather Main. Water from Powell Lake is important for power generation at the paper mill. Monitoring the snow pack in the early days helped determine if there would be enough water to get through summer. The first snow cabin is along the east shore at the Head. The second is in the high country reached by logging road and trail. Snow cabin along the shore at the head of Powell Lake. At the Head there's an old shake block cutter's camp from the 40s or 50s. 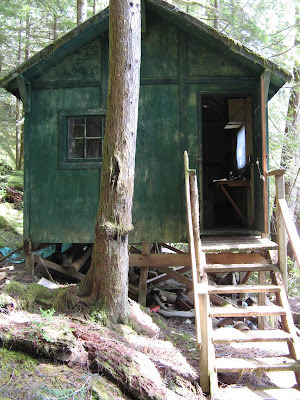 The cabin has fallen, but the outhouse made of cedar slabs still stands. The area is reached from the lakeside at low water or cross country through undergrowth from the main. Probably a root cellar at the shake block cutter's camp at the Head. Around Powell Lake there are logging docks and barge ramps that give access to the backcountry. On the west side of the lake between First Narrows and Olsen's Landing is a fairly new dock called Chip (Chippewa) North. The lower section was logged not long ago, but the upper part of the main connects to an old logging road that heads to Theodosia Inlet. Nearing Theo, old trucks have been left abandoned. Old trucks on abandoned logging road between Powell Lake and Theodosia. Another relic is on the south side of Goat Island near the Dunn Dock. 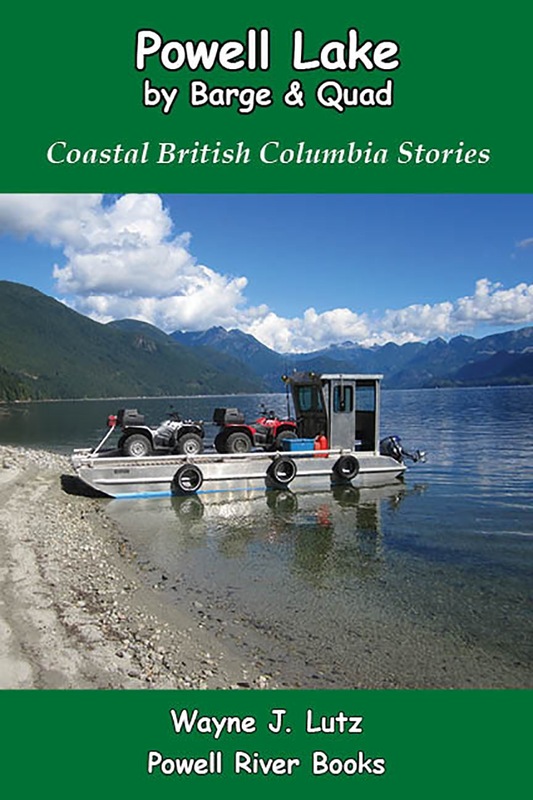 We landed our boat on the sandy shore and walked up an old logging road a short distance. 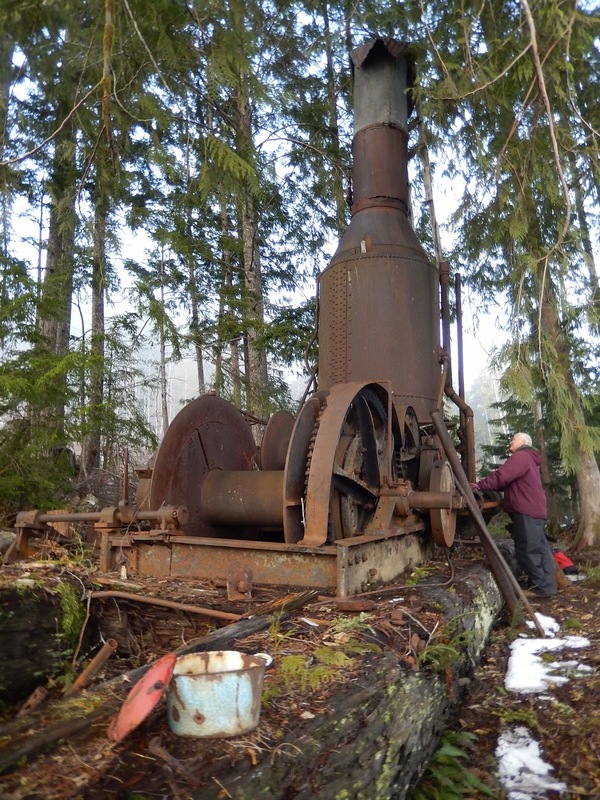 There we found this old winch from early logging days. Winch on south side of Powell Lake. There are lots of historic places to discover around Powell River. Each has a story to tell, and it's wonderful that people have left the artifacts in place for others to enjoy. 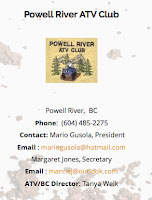 If you want to learn more about the history of Powell River here are a few links. 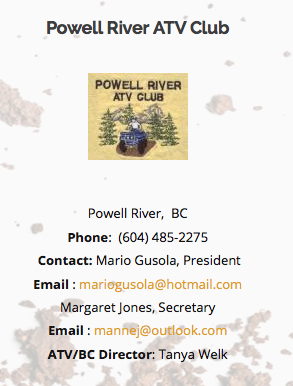 If you want to know more about exploring the Powell River backcountry by quad, contact the Powell River ATV Club.